It may have seemed that Knoxville deathcore brutes WHITECHAPEL were becoming less, well, brutish, with the passage of time. The band's last album, 2016's Mark of the Blade, with its persistent curb-stomp grooves, more prominent sense of melody and occasional clean vocals from usually flame-throwing frontman Phil Bozeman, was, if not more accessible, certainly less threatening than earlier efforts. Well, so much for aging gracefully. 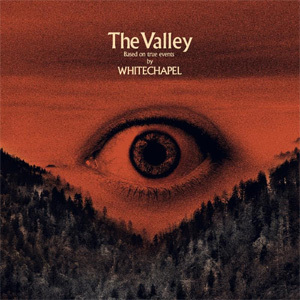 WHITECHAPEL's seventh album The Valley brings the menace and bludgeon back in a big way, even as many of Blade's traits carry over – also, in some cases, in a big way. The soul-baring lyrics and feral delivery from Bozeman – who chronicles the travails and traumas of his upbringing in unflinching detail here, hence the subtitle “Based on True Events” - are especially vivid and raw. And the band seems to have keyed on that with a more urgent and aggressive stance. The results are a grim, concussive and quite compelling outing. Bozeman has always been an imposing frontman, with his gravely, jet engine voice and naturally forceful presentation. This is especially true on The Valley – even during the extended clean passages that encompass entire songs, as on the harrowing “Hickory Creek” – thanks to his earnest, forthright lyrics. Indeed, the quieter moments can be the most particularly jarring on an album that is full of jarring moments. “I can't erase the memories, but I can erase humanity,” Bozeman declares in a near whisper during a brief mellow passage in the otherwise thunderous “When A Demon Defiles A Witch”, which leads The Valley off. “Hickory Creek” and “Third Depth”, though, offer a more traditional, even power ballady approach, with serene verses that build to more emphatic choruses or crescendos. Here, Bozeman echoes SLIPKNOT/STONE SOUR's Corey Taylor or TOOL's Maynard James Keenan with his deep, deliberate clean singing. But there is small comfort to be had, despite this, as he dispatches lines like “The worst that could happen is you never see me again, But the worst is yet to come, my friend” or “I can't wait to see your flesh turn pale, When I hear the last breath you take fail.” “Every Rose Has Its Thorn” this is not. All this would likely come across as overbearing or just plain ponderous were it not for the aforementioned variety in musical mood and tone from Bozeman's bandmates. The much-needed ebb and flow is here in abundance, with the full-on death metal of “When A Demon Defiles A Witch” and “We Are One” offset by the buoyant groove of the bruising, yet infectious “Black Bear”. Or the deathcore shudder of “The Other Side” or “Lovelace” and suffocating doom of “Brimestone” countered by the much softer, but surprisingly effective “Hickory Creek” or “Third Depth”. The agile drumming of Navene Koperweis – formerly of djent wizards ANIMALS AS LEADERS – is a real X-factor here. He helps keep the rhythms consistently vibrant and largely steers them clear of the turgidity that marked some of the band's earlier, more breakdown-focused work. Ben Savage's sleek leads bring some added depth as well, even as the band's triple-guitar attack doubles down on the heavy much of the time. And the band as a whole handle the well-out-of-character material with aplomb, both from a compositional and performance standpoint. WHITECHAPEL takes what could have been a huge embarrassment and instead makes it triumphant.